The dining area of the Brazilian eatery Tudo de Bom, above, sat empty Wednesday at the McCully Shopping Center following its abrupt closure. In an industry with an already high failure rate, Honolulu restaurants are feeling the pinch in the economy. From the demand side, customers worried about the economic downturn are dining out less, while on the supply side, restaurants are being hit with higher costs of doing business. Independent restaurants without deep pockets are being hit the hardest, not only by higher commodity costs, but rent and utility increases. Already this month there have been two casualties: the Chef's Table, which had a 10-year run at the Hawaii Kai Towne Center, and Brazilian barbecue restaurant Tudo de Bom, which had a four-year run at McCully Shopping Center. Business continues to be brisk for some restaurants, like at Downtown, above, the restaurant at the Hawaii State Art Museum, as patrons packed the place thursday at lunchtime. here, server Mai Tran took orders from a table full of patrons. Some restaurateurs, like Dave Stewart, also have decided to hold back on new ventures for now. Stewart said he did not like the looks of the future in his crystal ball, and thus, he is not moving forward with his $500,000 investment into La Rhumba - a Caribbean restaurant and bar in Chinatown that was to open this summer. Other restaurateurs, however, are undeterred by the economy and forging ahead with new ventures. Whatever the case, the stakes are higher for all restaurants, which must find creative ways to cut costs while also competing for customers who are more discerning about where and how often they dine out. 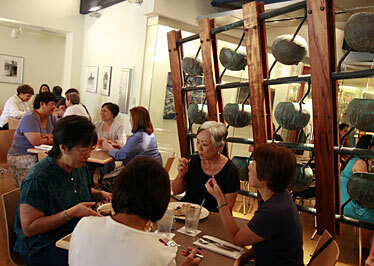 While some restaurants are having a rough time, business was brisk for lunch Thursday at Downtown@HiSAM, the restaurant at the Hawaii State Art Museum. Honolulu restaurants are feeling the pinch in the economy, as consumers worried about the higher costs of living refrain from dining out as much as they did when times were better. At the same time, the restaurants also are being hit with higher commodity costs that squeeze their margins even more. Some, like Chef's Table, are shuttered after years of doing business, while new ventures, like La Rhumba, are postponed until the economy gets better. For Chef's Table, an increase in lease rent at the Hawaii Kai Towne Center was the catalyst for the closure at the end of May. Co-owner Kathleen Knapp said the lease was about to be doubled and was not viable for the business anymore. "It's a sad thing for us," Knapp told the Star-Bulletin. "We had marvelous customers - about 80 percent of my business, both lunch and dinner, came from Hawaii Kai residents." 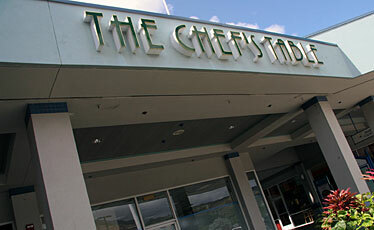 The Chef's Table restaurant, left, is now closed, but the sign will not come down for a few weeks. Knapp, who ran Chef's Table with her husband, Andreas, as the chef, said it is getting tougher for a small independent restaurant like hers, which served a unique, Austrian menu at reasonable prices. Knapp said the majority of the remaining restaurants at the center are mainland chains with multiple locations. "We're having an economic thunderstorm, with food costs, shipping and gas prices going up," said Knapp. "It's all having a domino effect on restaurants." Brazilian barbecue restaurant Tudo de Bom, which had a four-year run at McCully Shopping Center, is the latest casualty. Sofos Realty, manager of the center, said Tudo de Bom defaulted on its lease. Chinatown restaurateur Dave Stewart is putting plans for La Rhumba, a Caribbean restaurant and bar, on hold until the economic outlook brightens up. 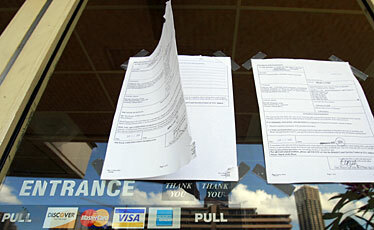 Legal documents, above, are taped to the door at the Brazilian eatery Tudo de Bom at the McCully Shopping Center following its abrupt closure. The restaurant was originally expected to open this summer, and Stewart was planning to invest more than $500,000 in restoring the 4,500-square-foot space at 32 N. Hotel St.
"At this stage I've decided I'm not going to invest any more money in new startups until the economy changes," Stewart told the Star-Bulletin. "If the people who work in Waikiki don't have jobs, then they don't come out and spend their money. If the engine isn't running at full speed, there isn't as much disposable income as there used to be." At the almost two-year-old Du Vin, Stewart said, he has adjusted by offering six different house wines for just $8, as opposed to just a selection of high-end wines. Restaurants that rely on the visitor market are, in particular, having a tougher time as those numbers go down. The 152-seat Holokai Grill at Waikiki Beach Walk quietly shut down in May, barely more than a year after it opened its doors. Managing partner Bill Tobin, who also runs Tiki's Grill & Bar in Waikiki, said lower-than-expected foot traffic did not cover operating costs. Restaurateur Fred Livingston, owner of Don Ho's Island Grill at the Aloha Tower Marketplace, is feeling the pain. What is saving him, he said, are reservations for private graduation parties this month. Victor Lim, chairman of the Hawaii Restaurant Association and operator of seven McDonald's franchises in Hawaii, said high commodity costs are affecting the industry the most. High-end restaurants tend to do all right in economic downturns, he said, because their clientele are not as affected. Casual quick-serve restaurants and fast-food chains, like his McDonald's franchises, also tend to fare well. 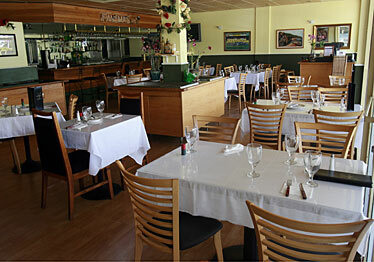 Roy's restaurant in Hawaii Kai is taking advantage of the downturn by remodeling. Operations manager Rainer Kumbroch said Roy's is weathering the storm. The Waikiki restaurant has been busy, and Ko Olina, so far, is tracking one of its best years, he said. But in these times, Roy's faces the challenge of keeping up its quality because customers will be more discerning about where they go out for dinner. It is the middle-market restaurants, however, that tend to get squeezed out, according to Lim. Retail leases are also critical to a restaurant's ability to survive. "Now, especially with less traffic, the rents continue to go up, along with higher food costs and utility costs," said Lim. "So the margins are being challenged." Not everyone is feeling the pinch. Some restaurants catering to local residents are actually doing quite well. On a recent regatta day, Buzz's Steak House in Kailua was buzzing, with crowds waiting for an empty table. Kenny's in Kalihi, a longtime local favorite, still gets weekend crowds. Both Town in Kaimuki and Downtown@HiSAM are healthy, according to chef/owner Ed Kenney, having attracted a loyal customer base. Kenney said his restaurants will not raise prices. But cost-cutting measures include shutting down one of the two air conditioners at Town in the mornings and afternoons to save energy. Elizabeth Watanabe, owner of the O Lounge, says the downturn brought her an opportunity. She is moving forward with plans to open Harbor Court Bistro - her longtime dream - at a spacious 13,000-square-foot space that was formerly home to Palomino and Cassis. The bistro is expected to open in July, featuring an eclectic menu at prices accessible to nearby office workers. "Going into any new business is a huge risk, but people were more willing to negotiate," said Watanabe. D.K. Kodama, a chain restaurateur with ownership in Vino, Hiroshi's Eurasion Tapas, longtime favorite Sansei and d.k Steak House, is partnering in yet another venture: the Counter Burger, a gourmet burger eatery slated to open at Kahala Mall this fall. 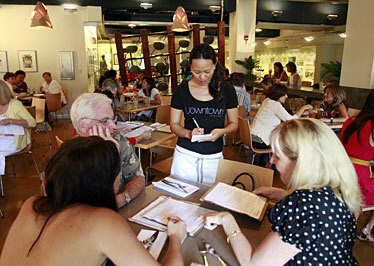 Kodama said he is feeling a little bit of a slowdown among his Waikiki restaurants. The Waikiki Beach Marriott Resort & Spa is adjusting to economic times by offering d.k Steak House and Sansei customers free parking. But Kodama is confident his restaurants will weather the economic downturn because, after all, "People still have to eat."